The artist Mlada Finogenova was born in a creative family. Since childhood, she loved to draw and devoted her youth to art education. Later she became one of the brightest and most talented representatives of the union of artists. The painting, called the “Bright Day”, was one of the most beautiful of her works, which you want to consider again and again. The atmosphere of calm and comfort reigns on the sunlit veranda. Every detail is present on the canvas is not accidental. 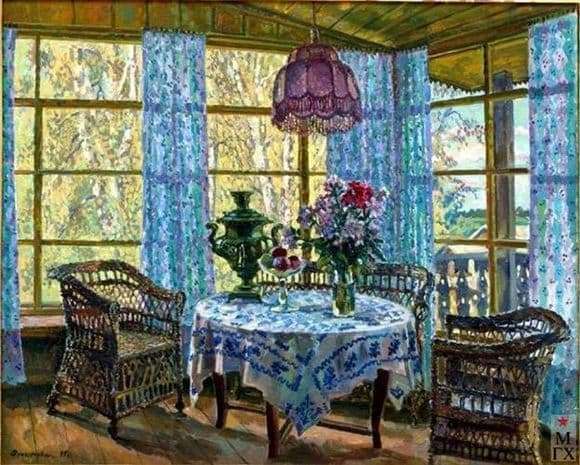 Looking at the picture, the viewer unwittingly begins to present himself in this wonderful room, in which there is a pleasant aroma of flowers and fresh boards. In the center of the picture there is a round table, covered with a bluish tablecloth, with a blue ornament. It is crowned with a large samovar. It symbolizes the hospitality and warmth of home communication of everyone who gathers here for a cup of tea. Fresh fruits and a bunch of bright garden flowers adorn this table. Around him are wooden chairs with intricate weaving. In the afternoon the room is lit by the bright sunbeams, and in the evening a light bulb is used for this, surrounded by a beautiful shade. It is made of lilac fabric trimmed with fringe. Due to this, even in the dark there reigns a relaxing and magical atmosphere. The floors, walls, window frames and the ceiling are made of light wood. This gives the room a secluded rustic comfort, combined with natural harmony. Huge bright windows on this veranda offer an excellent view of the birch grove and distant green hills. The clear sky, with fluffy white clouds, serves as a dome for all this beauty. The window openings are curtained with blue curtains with pink and green stripes. All these colors serve as a color accent throughout the canvas. The picture of Mlada Finogenova is filled with comfort and warmth, which can warm the soul of even the most captious viewer.